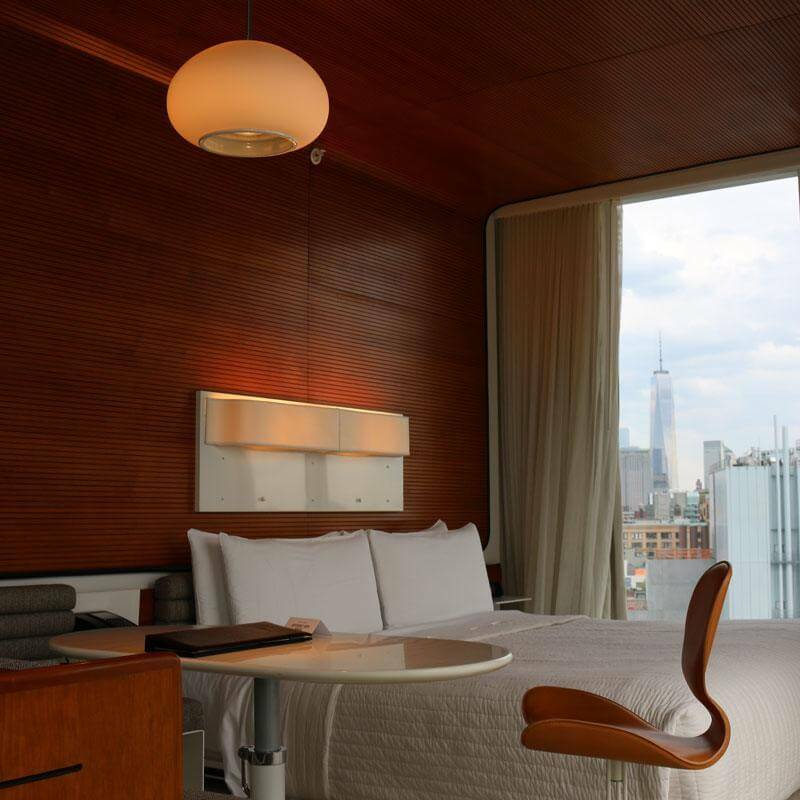 The Standard, High Line hotel is anything but standard. Our heads turned in sync as the yellow cab pulled up to this Manhattan hotel: The logo of the hotel is its name – upside down! We are here to meet with Daniela Maerky, a Swiss abroad who is in charge of special projects at The Standard, High Line. Daniela was born and raised in pristine St. Moritz, in Switzerland's Engadine region. At the age of 18, she had seen enough of that "small town", so she moved to Lausanne to attend the famous hotel school. The international environment and broad range of studies wet her appetite to pursue her career in the hotel industry. After her first internship in Monte Carlo ("It was like St. Moritz, just at the ocean"), she found herself in the right place at the right time. Thanks to the chance encounter with a guy in an Etro Suit at École hôtelière de Lausanne, Daniela hopped across the Atlantic in 2008. She became part of a small team in charge of opening up a brand new hotel in New York: The Standard, High Line. Daniela is in charge of marketing, public relations and special projects. Given The Standard, High Line's hip location in Manhattan's thriving Meatpacking District, there is always something special going on. "We curate events and partnerships which make the brand what it is and what sets it apart from other hotel companies. We combine fashion, arts, and entertainment and create a social and cultural hub. It's a very dynamic and creative working environment," says Daniela. During the cold NYC winter months, Daniela tries to introduce some Swissness to the hotel: Right outside the lobby, an ice-skating rink with après-skate bar is set up. And for the true Alpine feeling, traditional cheese fondue and Glühwein are served! Daniela's vision of breathing life into the hotel and making it a social hub became apparent when she took us to the lounges on the 18th floor. Preparations for a private event were under way, so we quickly stepped outdoors onto the rooftop. The views from up there onto the Hudson River and Manhattan quite literally took our breath away! The streets and avenues of Manhattan are busy. Everyone in the city is "on the go" pretty much all the time, and "nobody really cares about who you are." Those are Daniela's words, but this is exactly what she likes about living in New York: "You can really be yourself – you're incognito." It is not someone's background that allows them to climb the corporate ladder, but rather their reputation as a good employee. "What counts is how good you are in what you do, how well your personality fits with the company's culture, and most importantly, your passion. If you prove yourself, they will give you a chance to grow. In NYC, the opportunities are endless." In part due to her dedication to work and the people she has met, Daniela is very fulfilled with her career: "In NYC, young professionals are given chances probably more so and faster than in Switzerland. I was 23 when I started my internship at The Standard, and by 27, I became the Manager of Special Projects. At The Standard, I was really able to cultivate my vision of hospitality and expand my know-how into different fields. I hope that one day, I can bring my experience to my parents' hotel in St. Moritz, The Hotel Steffani." When Daniela first arrived in New York, she was dazzled by the energy of Manhattan. "You really have to find something which balances your life, because it's wild and crazy. You have to learn how to stay grounded. I am sometimes in a love/hate relationship with NYC, but the energy and all the exciting things the city has to offer quickly remind me of how lucky I am to be here." Daniela's New York tip on how to maintain a healthy work-life balance is yoga - and a good glass of red wine with friends. While she loves the vibrant energy of the city and all the endless things to explore every day, she does not see herself in the Big Apple forever. "If you would have asked me in 2008, I would have never expected to still be here now - but you become a sort of NYC addict. I was able to grow up here, professionally and personally. I learned a lot about myself, became stronger, and probably a little more crazy. New York City allowed me to experience and discover everything what I have been missing in Switzerland." It is when Daniela steps away of her busy daily life to spend some time back home in Switzerland when she notices the things that she has been missing in the big city. At this point during our chat, Daniela's thoughts travel to Switzerland and those salty butter pretzels she always indulges as soon as she arrives at the airport in Zürich. "I think what I miss the most about Switzerland is the simplicity. In New York, we pretty much work all the time, always have something going on, do 75 things at the same time, yet still say that that we're not doing enough. And of course, I miss the beautiful nature." So every time Daniela arrives in Switzerland, before heading to her parents' house in St. Moritz, she will go for a quick dip in the Zürisee - now that's quality of life! Out of curiosity, we brought up the topic of ordering coffee as a New Yorker. Daniela explains: "Every New Yorker has their specific coffee. And I mean very specific coffee. I go to Stumptown Coffee every morning, and they know exactly what I want. A two percent latte, hot steamed milk with two shots of espresso, medium size - and a straw. My barista prepares it for me as soon as I walk in the coffee shop." We agree: Although Daniela is from the beautiful Swiss alpine town St. Moritz, she has turned into an über-New Yorker! One way Daniela keeps her Swissness is through her self proclaimed English accent. "I like having an accent. It allows me to build more conversations as people get curious." Daniela passes my Swiss German test with a perfect score. Having lived abroad for many years, I can attest that it is not always easy to keep your native dialect fresh. Regularly speaking Swiss German with her roommate and some of her friends allows Daniela to stay fluent - and this in all seven languages she speaks! "Unfortunately, I am not allowed to speak Swiss German at the office. My coworkers think that it sounds terrible..."
Daniela's roommates in NYC have come from places like Zürich or Basel. She also maintains close ties to the local Swiss community – some of which she used to know in Switzerland. "There is a big Swiss community, and when you come from the same country and you're far away from home, you're connecting much faster. I have lots of Swiss friends here but also lots of new incredible friends for life from all over the world. When you live abroad, you create your own little family away from home." We are curious how Daniela deals with homesickness – or what she does when she misses Swiss foods. "My Swiss friends and I love to go to Café Select! They serve Züri Gschnetzeltes and Rivella!" But when we hand Daniela our gift from PanoramaKnife, a special cheese knife, she confesses: "I am actually the weirdest Swiss person in the world, because I don't like cheese! It's actually the only food I don't miss from Switzerland." In many ways, we can tell that Daniela is embracing her life as a New Yorker. We can picture her walking down the streets with a cup of coffee in one hand while talking on the phone and waiving a cab – a real New Yorker is clearly a multitasker. 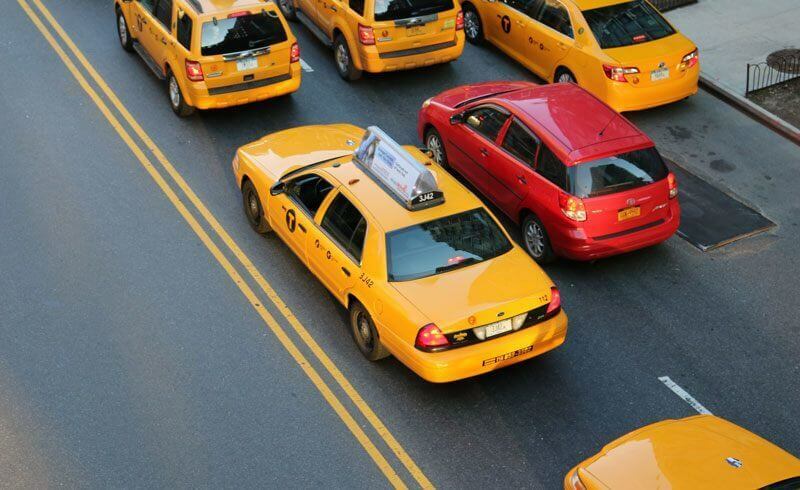 Although being a New Yorker, there are a few things that stun Daniela about living in NYC. They make her stick to her Swiss roots: "Not seeing my friends for three months although we live on the same street, because everyone in the world is too busy. I would not walk around in my gym clothes in the city, ever! I actually enjoy sitting down to enjoy my coffee rather than running around with a take away cup, and... I am trying to be polite and let other people steal my cab!"